Last week, DMS Holland received an order to be extra proud of. The owner of ABBO Yachting from Antwerp has opted for DMS Holland’s stabilisers and its very good service for the second time in the relatively short existence of DMS Holland. Back in 2013, the first order with DMS for this owner had order number 011. Only 5 years later and DMS is proud to be able to assign the second order a significantly higher number: 152. 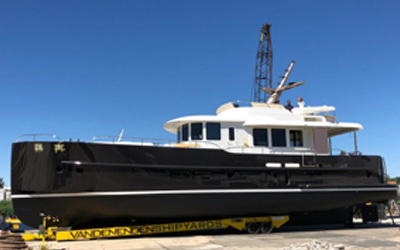 The new 62ft Alm Grand Voyager, which has been designed by Theo Werner, will come out of the water at the end of August in Den Bosch at Moonen Shipyards, following which the MagnusMaster system will be professionally installed. The specifications of this beautifully designed vessel can be found in the attachment which show that fins had initially been specificed. DMS Holland and ABBO Yachting both look forward to continuing this great and successful collaboration.